Welcome to the GSTAR Hookah. This 18 inch quality hookah is an example of modern production applied to an old tradition. 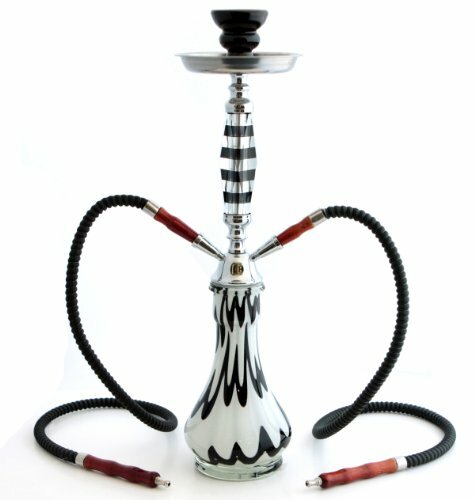 This hookah is equipped with a unique stem base design; allowing you to interchange to a 1 or 2 hose hookah based on your preference. This is can be done by simply installing the additional ball bearings and stem valve, both of which will be included in your shipment. It is easy to assemble/disassemble, clean, and store away, making it the perfect hookah to take on the road. It is easy to assemble/disassemble, clean, and store away, making it the perfect hookah to take on the road. It works just as well as its larger counter parts and is very popular among new hookah connoisseur and seasoned hookah connoisseurs around the world. GSTAR hookahs are built in an Egyptian configuration and come with: bottom base, center shaft, down stem, hookah hose(s), ceramic hookah bowl, charcoal tray, tongs and poker. Designed for years and years of hookah pleasure. If you have any questions about this product by GSTAR Hookah, contact us by completing and submitting the form below. If you are looking for a specif part number, please include it with your message.